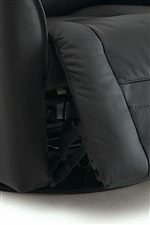 Coordinating in both function and style, this power wallhugger recliner is the perfect addition to any space. Featuring premium elastic webbing and high-resiliency foam cushions, both pieces offer the perfect blend of cushion and support. In addition, this chair includes space-saving features, so you're able to place the chair close to the wall while still reclining back. Exuding a contemporary style that will update any room, this recliner will bring a casual modern atmosphere to any living or family room environment. 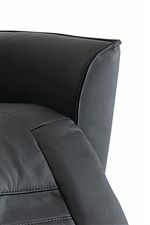 The Glacier Bay Contemporary Power Wallhugger Recliner with Flared Arms and Defined Headrest by Palliser at Jordan's Home Furnishings in the New Minas, Halifax, and Canning, Nova Scotia area. Product availability may vary. Contact us for the most current availability on this product. The Glacier Bay collection is a great option if you are looking for Contemporary furniture in the New Minas, Halifax, and Canning, Nova Scotia area.